What is Iron and what role does the mineral play in the body? Iron is one of the most abundant metals on Earth and it is vital to normal human physiology and primarily to all life forms. This is because iron is an integral part of several enzymes and proteins that are responsible in maintaining a healthy body. Iron is a significant component of proteins that are involved in the transport of oxygen in the human body and also has a role in cell growth regulation and differentiation. Heme is an iron-containing compound that is found in several biological vital molecules. Myoglobin and hemoglobin are the heme-containing proteins, which are involved in the storage and the transportation of oxygen. Hemoglobin, the primary protein located in red blood cells, represents about two thirds of the body’s total iron content. The essential role of hemoglobin in being able to transport oxygen from the lungs to the other parts of the body is because of its special ability to acquire oxygen during the small span of time that it spends in contact with the lungs; and in releasing oxygen when needed in circulating through the tissues. The function of myoglobin in the short term storage and function of oxygen in muscle cells is in aiding the matching of the supply of oxygen to the demand of the working muscles. Iron plays a major role in the overall production of energy, and is a constituent of numerous enzymes such as iron catalase, cytochrome enzymes and iron peroxidase. This mineral is also involved in carnitine production, which is basically a nonessential amino acid that is vital for the proper utilization of fat. Many different functions of the immune system are also dependent on the amount of iron present in the body. The human body has the ability to conserve the usage of iron by means of reusing the old red blood cells in making of hemoglobin for the benefit of the new red blood cells. However, it is known that iron deficiency is one of the most common nutrient deficiencies, not only in the United States but in other parts of the world as well. Having reduced iron status can be due to inadequate dietary intake, parasitic infection, poor absorption or/ and medical conditions that cause internal bleeding. Individuals who regularly donate blood, women with excessive menstrual bleeding, pregnant or lactating women, and people who use antacids and other medications that can interfere with the body’s absorption of iron can be at risk of having iron deficiency. Aside from that, children, vegetarians and the elderly often have insufficient amount of iron intake. Iron deficiency can cause hypochromic and microcytic anemia, which is a condition that is characterized by underdeveloped red blood cells that lack hemoglobin, thus reduces the red blood cells’ oxygen carrying capacity. Prior to the development of iron deficiency anemia, one can suffer from poor iron status by experiencing different symptoms such as weakness, fatigue, decreased ability to concentrate, loss of stamina, increased susceptibility to infections, headaches, dizziness, brittle nails, depression, apathy and hair loss. Those who have a poor intake of the iron mineral can also exhibit an unusual eating behavior known as pica, wherein individuals eat inedible or unsuitable materials such as clay, dirt, charcoal, laundry starch and even paint chips. Iron deficiency in children can be associated with a lower IQ and learning disabilities. Acute ingestion of large amounts of iron-containing supplements can lead to iron poisoning. Such iron toxicity symptoms lead to vomiting, nausea, shock, damage to the lining of the intestinal tract, and liver failure. It is also one of the leading causes of death for young children. Oatmeal, soybeans, lima beans, tofu, lentils, molasses, spinach, raisins, grits, whole wheat bread, turkey, beef, chicken, tuna, shrimp, crab, pork, clams and oysters are some of the common food sources of iron. For individuals who are always on the go, it is advisable to take in some iron supplements in recommended dosages. 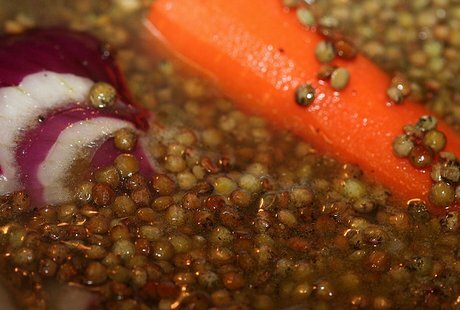 Lentil Photograph by *clarity*; Linus Pauling Institute; Office of Dietary Supplements; Medline; USDA National Nutrient Database; Better Health; University of Maryland Medical Center.